Your Talent. Your Idea. Your Film. Indie Films are our passion and we want to give them an international platform, with an audience, which is fascinated of individual and creative film ideas. Form follows function: that means, that every plot need it`s own storytelling and filmmaking technique. 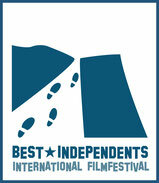 Share your creativity with the audience and become a part of BEST INDEPENDENTS INTERNATIONAL FILMFESTIVAL! "The culture of independent film criticism has totally gone down the drain and this seems to come with the territory of the consumer age that we are now living in."